Why do some monsters have names while others don't? The best place to start may be with the Cybermen. After all, they went from having names to not having names. Moreover, they did it more or less within one particular story, 'The Moonbase' (if I remember rightly, they had names in the script but these were not mentioned on screen). The first thing to mention is that this is the story in which they went from being threatening because they are emotionless and logical to being threatening because they're one of those "terrible things" bred in those "corners of the universe" that "we" have to fight, when they were no longer fighting to save their planet but to steal ours, when they lost their human hands, when they started (so early!) saying things like "Clever, clever, clever! ", i.e. when they became overtly and deliberately evil. But there has to be more to it than that. After all, vampires keep their names. Loss of humanity and the acquisition of evil intent are not enough to strip them of their names. Moreover, the Cybermen are not the only Doctor Who monsters to lose their names. There's also the Daleks, who lost their names when they stopped being Kaleds (or Dals). This loss of name is very important. In the 'Moonbase' Cybermen, it seems more like the final stripping away of individual identity. It works similarly for the Daleks as for the Cybermen, and has similar wider connotations when it comes to both these races. Veering back to the point... notice how the conversion of Lytton or Stengos into Cyberman or Dalek involves the loss of identity, thus the loss of name. When Stengos sees his daughter, his first word is her name. He remembers her name, and hence his own, which is what launches his psychological struggle against his Dalek conditioning. The named/nameless distinction maps roughly onto the biological/robot-or-cyborg distinction, and both are really about individuality vs. the loss of individuality. The Daleks and Cybermen act far more on a kind of groupthink than, say, the Silurians. The mechanically-augmented Rutans too seem like a hive mind (the individual Rutan refers to itself as "we"). The robot or cyborg is the expression of the non-individual, the impersonal, the standardised. The critique of collectivism implied by these monsters of conformity, mechanisation, organisation, groupthink, lack of individuality, etc., connects with the prevailing conception of collectivism as being inextricably bound up with authoritarian statist government, an absence of formal democracy, an official political ideology, regimentation of the individual, the destruction of privacy, the imposition of conformity, etc. This conception lumps together those two bogus-collectivisms, fascism and communism, in the manner of the influential theory of totalitarianism. The Daleks and Cybermen are the two great monsters of Doctor Who, a product of the liberal capitalist culture industry in the aftermath of World War II and during the Cold War, and they actualise this set of notions almost too specifically. Akin but seperate and ultimately opposed, not from moral imbalance but because of their essential similarity, both emerging from differentiated but kindred forms of anti-individualist state control, the Daleks and Cybermen are differentiated but kindred forms of the dehumanised, collectivised, technologised totalitarian robot/cyborg monster. They are the Nazi and Soviet forms of the same totalitarian species. I guess this is the place for the inevitable 'Cyberia' pun, yes? The Daleks emerge from a fascist collectivism: the regimented, indoctrinated, Nazi-esque Kaleds in 'Genesis of the Daleks'. The Cybermen eventually find their own genesis (courtesy of Big Finish) in a snowbound revolutionary emergency government: the policed and surveilled Mondasians in 'Spare Parts' live in a mirror version of the '50s (the high point of the Cold War), ruled by the "champions of the proletariat" who are suppressing private enterprise. 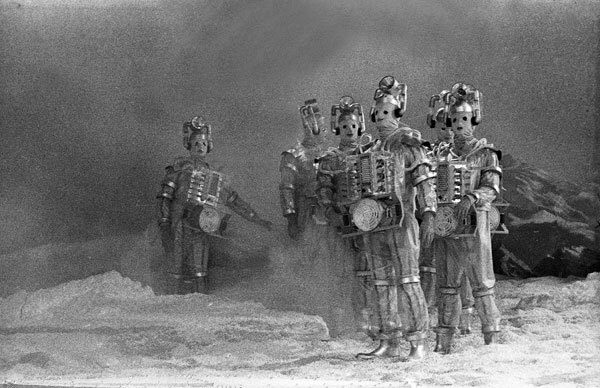 Even the critical nature of life on Mondas, and the Cybermen's onscreen tendency to find themselves fighting for survival as well as attacking people, seems like a haunting half-memory of the fact that the Soviet regime was under external attack for much of its existence (the Russian Civil War and, later, Operation Barbarossa). The two 'big' monsters of the show seem like echoes of the two great 'cousin' totalitarianisms (as they were seen by people like Carl Friedrich and Zbigniew Brzezinski). In this light, the confused similarity and interpenetration of these monsters seems as salient as the fact that, until long after the end of the Cold War, they never met. The Daleks and Cybermen are both races of robots with flesh hidden within them, i.e. bodies augmented and changed by technology. They are both said, at various times, to be emotionless, dependant upon rationality and logic. Both have absolute leaders which function like centralised brains (the Cyber Controller, the Dalek Emperor... with Davros, all his Hitlerian attributes notwithstanding, something of an outlier... though, of course, he eventually merges with the Emperor in 'Remembrance of the Daleks'). They both recruit by forcible conversion. They both employ (body snatcher paranoia style) covert infiltration, brainwashing, mind control and/or replacement of people by 'duplicates'. They are both aggressive imperialisms that attack secure, human (implicitly Western) structures (the Moobase, the colony on Vulcan, etc.). They are both defined by regimentation, conformity, unanimity, groupthink, ideology. They both have absolute political philosophies that motivate them: racial chauvinism (Nazism) in the case of the Daleks, ruthless utopian utilitarianism (Communism, as it was percieved) for the Cybermen... so it's not hard to see the differentiation amidst the similarities, or their referants. Both alter the mind of the human as conversion takes place (c.f. Lytton and Stengos). The Daleks are even said to be played "indoctrination tapes" in their infancy according to Ben Aaronovitch's novelisation of 'Remembrance of the Daleks'. It's surely not hard to see how all this echoes the perceived features of 'totalitarianism': regimentation, conformity, thought control, leader cults, ruthlessly mechanised military utilitarianism, state ideologies, the destruction of individuality and personal freedom, insidious encroachment upon the freedom of others, etc. So, Daleks and Cybermen are different iterations of the same thing, or at least of intimately similar things. (Which isn't to say that either always mean exactly the same thing from story to story over their long histories.) And yet they never meet. They remain divided from each other by an absence, a gap, a field of silence. There is a peculiar frisson whenever this silent field is almost breached, as when both races are mentioned and shown in succession at the end of 'The War Games', or when a Cyberman briefly appears on Vorg's Miniscope shortly after he mentions Daleks. The story that best expresses the widespread cultural notion of totalitarianism, with its lack of qualitative differentiation between fascism and communism, is 'Inferno', which - irritatingly - has biological monsters (albeit ones which are inextricably linked to machinery because of their origins). On the whole, however, the totalitarian idea is expressed in Doctor Who via the robot/cyborg monster that has lost its name, and hence its individuality. Daleks and Cybermen are embedded in the basic assumption - implicit in 'totalitarian theory' and its colloquial and/or revisionist variants - that political forms other than bourgeois liberal capitalist democracy are pretty-much-inherently tyrannical and destructive to the freedom of the individual (the implicit flipside being that liberal capitalism offers the only opposite path and that all challenges to it run the inevitable course into tyranny). The basic circular chain of associations that mirrors this within the semiotic system of Doctor Who runs like this: robotic/cybernetic = anti-individualist = totalitarian = robotic/cybernetic. In a superb example of the promulgation of ideology through the culture industries, freedom is thus assumed and asserted to be the freedom of the individual, apparently exemplified by the fundamentally Western 'humanity' of, say, the crew of the Wheel. Between them, the Daleks and Cybermen represent the two flavours of 'totalitarianism' that menaced the free West (i.e. the liberal capitalist order), their innermost and most essential evil being the suppression of individual liberty. None of this is to say, by the way, that individual freedom is actually 'bad' or unimportant... on the contrary. But the best expression of how our culture really views individual freedom is the fact that corporations are legally classed as people, thus entitling them to many personal liberties, while real people are usually far more circumscribed and punished by the law than the corporations they work for or buy from. As usual, capitalism's boasts are lies. It is actually a very bad system when it comes to the individual liberty of most people (who have to spend most of their lives working for others just in order to live) while there is nothing inherently destructive of personal freedom and individual liberty in the idea of social collectivism. Nevertheless, these ideas are cornerstones of liberal capitalist democratic ideology in the 20th and 21st centuries. Capitalism IS democracy and democracy IS an aggregation of individual liberty... meanwhile, collectivism is inherently undemocratic and will always destroy personal freedom and self-determination. To be fair, the great self-trumpeting collectivisms of the 20th century were destructive of personal freedom in many ways, but the idea that they were 'socialist' may be evaluated by remembering that 'Nazi' actually stands for 'National Socialist', and the Nazis' favourite early slogan was "Death to Marxism", their central idea being the Bolshevism was a Jewish conspiracy to conquer the world. To think that their (or Stalin's) authoritarian statisms were collectivist or socialist is to fundamentally misunderstand collectivism or socialism... indeed, it is to misunderstand these ideas in the exactly the way that Hitler and other capitalist leaders wanted people to misunderstand them. The Nazi hatred of Bolshevism, the American anti-communist rhetoric, the banalities and misprisions of 'totalitarian theory', the hollow impostures of the nouveau philosophes and the revisionist historians of revolution, the tendency of the modern U.S. looney-right to call Barack Obama a socialist, the assumption of those in favour of humanitarian interventionism that - unlike Ba'athist bullets - bombs from liberal capitalist countries are somehow humane, the widespread feeling (evinced in 'Inferno' for example) that fascism and communism were so alike in their opposition to individual freedom as not to need differentiation.... these are all (amongst other things) expressions of that over-arching ideological notion: the liberty of the individual is essential to capitalism (which is thus inherently democratic) and inimical to collectivism (which is thus inherently totalitarian). That, essentially, is what's in a name: the individual human right... to live under capitalism forever. NOTE: There's a lot more to be said about this. The Cybermen, for example, may stem partly from reactionary conceptions of totalitarianism as the only possible alternative to capitalism... but they also sometimes work as an unflatteringly honest mirror to capitalism. They are, initially, the dark side of Wilson's "white heat of technology". As Simon Kinnear once pointed out in Doctor Who Magazine, they can sometimes look and act and think like the psychopathic corporation... indeed, this thought leads to all sorts of other issues. The extent to which corporations work like authoritarian states, for instance. It's no accident that the Cybermen have frequently meshed with and emerged from capitalist concerns, from International Electromatics to Cybus Industries. But going into this would mean going into how the Cybermen (and, incidentally, their cousins the Borg) reflect the ethic of the self-interested rational actor of the mythology of mainstream economics: the unicorn-like utility maximiser of the theoretical equibalanced market, always perfectly well-informed and logical... and, in some versions, morally obliged to be utterly ruthless. It would also involve going into the way that Communism (as it actually existed after the decline of real revolution) was actualy a form of bureaucratic state capitalism. All of which would take us well away from our brief for this post. But don't worry, I'm obsessive enough to write it one day. Meanwhile... happy new year! Good to see you posting again, Jack, and this one in particular is a fantastic doozy! Just a couple notes while I digest all this. The first is the "monstering" of automation. Whether it's fascist Daleks or communist Cybermen, both are monsters of automation, of the factory. I wonder if this is a fear of the loss of human creativity. Before we had machines to make our goods, we had ourselves to make our goods, and much of the value we accorded ourselves comes from our creativity. With the advent of mechanization, this value has been lost. "Goods" are a referent to commodities, to products, making them ends in themselves rather than making *people* ends in ourselves. Not that I'm against automated processes. We don't like doing tedious work, difficult work, do we? Better to have a machine harvest the crops, in much less time than we ourselves would spend, the better to free up more time for telling stories, I would think. Which works as long as those crops are equally distributed. But I wonder if some of these nameless monsters aren't just a reaction to statism, but to materialism. Certainly the Cybermen, with their complete denial of death, are the ultimate in materialistic values. The Daleks, on the other hand, are motivated by their hatred of the Other. We really don't see much of their engagement with economic processes, and certainly not of the arts. The other point, which I was fully expecting you to make, and which utterly surprised me that you didn't, is the fact that the Doctor has lost his name. He maintains a title, The Doctor, but from the very beginning his identity has been a mystery. Doctor Who? We hear it so much, but answering this question must make silence fall. And yet is there anyone who is so possessed of interiority and identity than the titular character? Or is his namelessness an indication that he too is a monster? The anonymous hacker, anarchist, destroyer of systems, to a capitalistic society the chaotic maelstrom in his wake is surely monstrous. If namelessness is coded as monstrosity, then the Doctor is a monster, and this is precisely the kind of monster he is. Because without an identity, without a name, he can slip through the cracks; the powers of State depend on names to enforce their laws and identify their dissidents. So namelessness is also a ticket to freedom. If this is true, then what you've got is an indictment of "pure individualism," the complete gratification of the ego without regard for Others. We all need some ego -- even the Doctor needs a title, even one as generic as Doctor -- because we all have interiority, and there's no "social" without individuals. But it kind of points to the central tension of collectivism: there's no point to interiority and the individual *without* the social, without Others. The second time the Daleks and Cybermen get together, they don't fight. They work together as part of a universal alliance, along with Sontarans and Sycorax and Silurians and whatnot. And for a second, the Doctor is hopeful, because these quarreling people have put aside their differences to work for a common (social) cause. And then it hits him: they want to lock up the Doctor himself, the anonymous agent of freedom and interiority, and put him in a Box, the same icon that marks the Borg, the ultimate in consumer packaging. Jane - thanks for the kind words, and even more thanks for the long comment. It's very gratifying to get that kind of response. Regarding your remarks about automation, mechanization and the fear of the loss of human creativity... I'd personally be very tempted, as you'd probably guess, to link all that to the Marxist idea of alienation. I think the shockwaves of alienation brought about by modernity have resonated throughout Western culture, and one of the most noticeable cultural effects is the concentration of the SF genre - from Frankenstein onwards - upon the autonomous product. Industrial capitalism is the era when the commodity becomes alienated to the point of seeming autonomy. This ties in to what I was saying about DW touching upon automation, robots and cybernetics etc at the 'Left End' in terms of commodity fetishism. The ultimate emblem of the fetishized commodity in DW is the Auton. I think commodity fetishism roughly corresponds to what you were saying about 'goods' supplanting people as ends in themselves. The essential idea of commodity fetishism is, after all, that under capitalism, relations between things take on the appearance of relations between people and vice versa. Your point about automation being no problem in itself is entirely in line with this viewpoint. Marxism is, as Terry Eagleton always says, the perspective for anyone who hates work, because it (Marxism) is all about leisure - i.e. leisure time (which would include the work we do for ourselves and for our own reasons) is when we are unalienated, so how can we arrange society so that we all get much more of it? The reason we've never come up with a way of using automation, industry, technology, etc., for releasing humanity from most labour - perfectly possible - is that we're still in class society, which arose first on the switch from hunter-gatherer society (pretty leisurely most of the time, certainly by contrast) to horti/agriculture onwards (bloody hard work). Going back to the Cybermen, Frederic Jameson's view of SF as a "mode of production aesthetic" (opposed to fantasy which is romantic and ethical) might come into play here. I'm using the ideas crudely, off the top of my head, but in this view SF concentrates on the sheer physical/mechanical 'producedness' things... but DW, being also fantasy and children's fiction, grafts on the romantic and ethical dimension to a great extent. Hence the connection between the physical/mechanical 'producedness' of certain DW monsters linked to an ethical/romantic notion of the loss of human individuality, heart, soul, etc. Jameson's also really interesting in his ideas about the drive for Utopia. I think this is a key issue with the Cybermen (which I forgot to talk about in my post) in that they represent such a drive, but their envisaged utopia is a kingdom of absolute efficiency, enforced equality and sameness. This is another way of linking them to widespread conceptions of communism, in that communism is/was often conceived as a drive for an ideal consisting of completely levelled and featureless sameness, that evil version of utilitarianism I mentioned above. It's interesting to me, in light of this, that they have a homeworld called 'Telos', which is of course the Greek for 'end' or 'goal'. Marxism is often said to be 'teleological' (meant pejoratively). This sort of crit is part and parcel of the notion of Marxism and/or communism as a 'political religion'. Marxism is said to resemble a religion in that it is 'millenarian', etc. (though I personally don't see any necessary reason why this need trouble anybody... the pejorative inflection rests upon a crude, Manichean reading of religion and the history of social movements). But, once again, we see the cousinship of the Cybermen and Daleks in that the Daleks are the ones who end up with a ‘political religion’ in ‘Bad Wolf’/’Parting of the Ways’ (though that story, coming smack in the middle of the ‘War on Terror’, is more about neo-con Bible-bashing, fundamentalist Islam and, more interestingly, market fundamentalism). This, of course, ties into your very good point about the reaction against 'materialism'. The religious critics of ‘totalitarianism’ have sometimes seen it as a monstrous product of the Enlightenment, of an excess of Reason, of secular modernity, which is supposed to strip away the spiritual dimension of life, etc., to de-soul the human. That’s surely got a lot to do with Cybermen and Daleks, as you say… maybe that’s one source used when the romantic/ethical fantasy dimension is re-imposed on the SF ‘production aesthetic’. There’s a grain of truth to this ‘excess of Reason’ view in that capitalism is the spur/product of the Enlightenment, and capitalism *does* smash up older ways of thinking and looking at the world (not just by inventing encyclopedias but by changing lives in material ways), and it *does* fetishize the commodity at the expense of older fetishes, and/or commodifies those older fetishes. I’d say that this is the root, and putting it down to the influence of Reason (or whatever) is putting the cart before the horse. But still, I think the autonomous product monster of SF carries this connotation (of the relentlessly material/ist, of the nightmare of Reason) because it’s an echo of the alienation of commodity fetishism (as I blathered about above). And yeah, the horror of immortality, of the destruction of death, is part of it. The Cybermen do that, as you said, and so do the Daleks, especially in ‘Revelation of the Daleks’ where the idea of humans-made-into-Daleks is first introduced and is depicted as a kind of eternal living death… which draws on some of the great monsters of capitalist modernity, the vampires and the zombies… which are surely bound up with all sorts of modern experiences of monopoly and the commodification of bodies, etc. Interesting, by the way, that the Daleks invent the Cybermen before Pedler and Davis… they just call them ‘Robomen’… and the Robomen are zombies! You mention Dalek economic processes. I think the one story where we get a glimpse of Dalek economic processes in a social sense (rather than in the sense of how Daleks produce themselves – for that, see ‘Power of the Daleks’, itself politically confused in interesting ways) is ‘Day of the Daleks’… and, funnily enough, it looks like Stalinism! Gulags and state-run factories… brought about by the unintended consequences of ‘fanatics’ who want to change history, by revolutionaries. It’s a perfect representation of the view that grand political projects to change the world for the better through revolution just end in gulags. Totalitarianism theory, badda-bing! Hell, it goes back to Edmund Burke. The Doctor even gets to do the ‘why do you need to keep your people under control? Don’t they like living in Utopia?’ speech. But it’s interesting that this happens in a story that didn’t originally have Daleks in it. It was originally about the guerrillas and their time paradox. Their alt-future, inadvertently created by a revolutionary cell from the future and truculent commies from our time (“troops are already massing along the Russian/Chinese frontier”) leads to the gulags. The Daleks look incongruous in it because they’ve been forced into the Stalinist role, as the fanatics who run an economy rather than a race war. This is based on the widespread cultural representation of Nazism as fundamentally ideological (a set of evil ideas) and communism as fundamentally economic (a set of evil economic practices). But it still works because of the supposed cousinship of the totalitarianisms (i.e. communism was also made up of ‘bad ideas’, etc). Regarding the matter of the Doctor’s namelessness… it honestly never occurred to me in the context of what I was writing. I suppose it’s because of the divide between the concepts of ‘alien’ and of ‘monster’. He may be one but he’s evidently not the other, at least not literally. But what you say is very interesting. His namelessness is linked to his slipperiness, his habit of destabilising systems, of evading state tracking, etc., his very renegade-ship from Gallifrey, the ultimate overlooking establishment. I’m inclined to think that the moral (romantic/ethical?) status of the Doctor’s namelessness oscillates with the political orientation of the show over time. In one time he may a ‘good monster’ because he destabilises systems… if the era in question tends to view systems with hostility (i.e. the McCoy era, overall). In the Troughton era he starts as a ‘bad monster’ who destabilises good systems – his first ‘victory’ is even shown to be arguably as bad as a loss would’ve been – then becomes a ‘good’ defender of them (all those bases under siege), then veers to being a ‘good’ destabiliser of them before being abruptly terminated before he can get any worse. I’d argue that the Moffat/Smith era (what I’ve seen of it anyway) tends to show him as a ‘good monster’ too, but because he *supports* systems. There’s also the matter of ‘pure individualism’ that you mention. This may oscillate too depending on whether the Doctor is a hedonist. This is something Philip Sandifer has alluded to and I’m hoping he’ll elaborate on it. But I like your idea that his title connects with a tension between interiority and society, with both always inescapably linked while also sometimes in conflict. Maybe this inescapable tension is the node around which those oscillations (between being a good monster or a bad monster, an anarchist or an establishment-defender) occur. Here I thought I was going to get an early bedtime, and now I find three lovely missives in response to my babblings -- thank you! I'll try to do justice to your replies as best I can at the end of the day. Expect me to ramble, and make errors. I'm more convinced of your reading of Daleks than Cybermen, in part because of the confusion between motivation, the slipperiness of capitalistic constructions of Marxism, and the actual results we've seen spinning out of yesteryear's revolutions. I agree with Sandifer that the original conception of Cybermen was conceived in reaction to death, as if this essential part of life was in fact monstrous, and the hubris of trying to escape it; I don't think this has anything to do with Marxism, but materialism, perhaps. Devaluing the ultimate in immateriality, which is death, but also change. Change is the basis of Time. The Cybermen represent "communism" only insofar as their Cybersystem is essentially a totalitarian regime; that makes sense, fearing such regimes. But, not being as good a student of history as I should be, I don't exactly know why the Marxist revolutions have largely failed on such a large scale as we've seen -- failed in that they've morphed into the state-regimes of the Soviet Union and China, for example, which have largely abandoned their Marxist origins -- as you've said, I believe, they are state-capitalisms, not true communisms. Perhaps they are nameless because they've lost their "identity", insofar as the ideals of Marxism have largely been lost. Regardless, as someone interested in revolution, I don't have answers for the failures I see; the cynical part of me says that revolutions fail because the power dynamics we've been inculcated with exist at the subconscious level, and even earnest Marxists succumb to these patterns. The desire to have power-over other people does not originate in capitalism -- it is, perhaps, more fruitfully exercised there, but it's been with us long before then. So where does power-over come from? Is this part of human nature? I think you're onto something with "commodification," the objectifying of people. This is to think of people as objects, which is to divide the word materially. The antithesis would be to construct the world in terms of relationships, which requires empathy, itself predicated on feelings and the interiority that implies. This, perhaps, is the difference between materialism and "spirituality." Not to say I believe in "spirits," but rather that "relationship" is a pattern: the invisible lines we draw between people, connecting them to other people, and ourselves. Is it not fair to say this way of conceiving the world is a form of "communion?" Perhaps I'm inclined to Marxism precisely because it resembles "religion" in the etymological sense of the word -- it means "to link again," to re-form connections. Which is as close to religion in its hierarchical "state" form as Marxism is to Stalinist Russia. I'm a radical, I try to see the *root* causes, and think the problems of capitalism begin not with economic philosophy, but with psychology and identity. With "me" and "other." But all this is ultimately rooted in biology: life feeds on life, and brains (not just ours) have evolved to divide the world into products, objects, things to eat. Consumption. It fits. Which is why it's so hard for revolutions not to devolve, because tearing down systems isn't sufficient; without addressing the underlying psychology that led to the creation of those systems, similar systems end up getting created in their wake. And unfortunately, education -- reading philosophy, for example -- only goes so deep; the problems of self interest, objectification, and sacrificing relationships for power reside at the subconscious level. Drilling that deep takes more than philosophy, it takes stories, which is where Doctor Who comes in. Doctor Who, as any resonant mythology, goes two ways when it comes to the subconscious. It reflects what's inside -- not exclusively, it also reflects the conscious intentions of its producers, but as an outside observer I can't infer which is which. It also informs what's inside, though of course it's competing with all the other mythologies we're subjected to, not to mention all the cruft we've acquired. So this is why it matters -- it gives us a language with which to discuss some very abstract systems, which requires metaphor. It gives us a look-see under the hood, which is otherwise inaccessible to direct, conscious intention. And it gives us a means to change what's under the hood, which again is a sideways process. Not terribly efficient, but art rarely is. So, there's a problem in reading and writing Doctor Who (and I promise this will get back to Daleks and Cybermen.) In terms of reading, there's identifying what was put there "on purpose," and what crept in without anyone noticing. The thing with metaphors and symbols is that they are not singular truths. They accrue several meanings, even contradictory ones if the conditions are right. So while the Daleks and Cybermen represent the alienation caused by modernity, and the terror of state regimes, they also represent the threat of "narrative collapse," and the rejection of death. For an author who's conscious of these latter connotations, that may drive the dramatic consideration of their usage. Army of Ghosts/Doomsday, for example, plays with these latter meanings, and tries to redefine them at the same time. It's Rose's departure, and she starts the story by saying she's died. We then get into the story and discover that "ghosts" are appearing from "the other side." These ghosts are Cybermen, entirely consistent with Sandifer's reading of the Tenth Planet Cybermen. However, Davies' Cybermen are explicitly capitalist -- they were invented by a capitalist, who is assisted by another capitalist, who is the mirror-image of Rose's father. Davies is actively trying to change what a Cyberman "means" -- to the extent of writing a new origin story. Doomsday is also Billie Piper's departure, which means an end to "Rose stories." This is a form of narrative collapse, which is mirrored in the narrative by Rose's desire to stay with the Doctor forever -- a far greater threat, since it precludes any more "new companion" stories. The Daleks are the ones who open up a breach to the other side, allowing the Cybers -- who've been fought by revolutionaries -- to traverse the gap. The Daleks are more dangerous than the cybermen, because the Daleks are "genre-aware" -- they are more self-conscious than the Cybers, aware of the power of stories. They are more like the Doctor. He uses the power of negativity to dispose of them, opening up a breach into the Void, but this entails the loss of Rose. Which is sad, but good. Marxism, at least to me, is a negative movement. It identifies the ills of capitalism, but this is a reaction: I don't have a positive image of what it looks like, how a Marxist life properly conceived actually looks. I think it has to start at the level of personal relationships, at the level of family, which is where we first learn about power dynamics, and where most of our power dynamics are enacted. And to stand in our own power, we have to be able to answer the question, "Who are you?" The answer has to come from within, and from our relationships, rather than through the object-fetishization of capitalist systems. It's morning. Haven't read what I wrote above (it's a mess, right?) but there's one more thing I've got to get down, or I'll explode. I *am* interested in looking at the different systems the 11th Doctor comes up against, how to code them, and how to respond to the Doctor's actions. Saying that, my gut feeling is that Moffat isn't interested in looking at systems very much at all, he's interested in people, their relationships, and how they construct their identities, but let's see. Beast Below, for example, isn't really interested in examining the police state. It's interested in examining how we "code" aliens and monsters, and challenging those assumptions -- through juxtaposing the Doctor with the Beast. The Doctor is "monstered" and his choice to resolve the situation -- a medical intervention -- is the wrong one. Amy's choice is correct: lead the Queen to abdicate her power. The monster isn't a monster, and the people who run Britain aren't the monster, it's the *power relationship* that's the monster. Which is one reading. The other being that the Beast is a code for the subconscious mind (this is suggested by the poem) and what's really being examined is the relationship between that and the conscious self; the society is also a metaphor for the conscious, social self. Other instances are more straightforward. The Vampires of Venice are definitely the monsters, and they function as royalty/capitalists: they run a private school, and want to take over the city, filling it exclusively with their progeny. Which brings me to the Apollo astronaut, Nixon, and the Silence. We get our second historical figure, who the Doctor privately castigates; River, not so much. Nixon's juxtaposed with a "monster in the White House" in the prequel, so there's an awareness of how to code him. Though he's presented in the most positive light imaginable, the Doctor still destabilizes him at the end, insisting that Nixon record everything, which is ultimately his undoing. Which says the show isn't interested in stripping away the humanity of anyone, but approves of destabilizing power relationships. Behind all this are the Silence, who are the Big Bads of the Moffat universe; they are the only villains who truly succeed in victimizing the Companions. They are media-savvy: they know Doctor Who begins with the question "Doctor Who?" in the opening credits. They are a religious organization, but they dress in business suits, the clothes of modern state capitalism. They employ brainwashing techniques to control populations. Finally, they don't have names. The Doctor has yet to have success against them -- which is meta: the show, for all its efforts, hasn't put a dent in religio/state capitalism, but this system has successfully engineered the Doctor's death. The best the Doctor can do is use their methods against them, by showing them on TV admitting they're monsters. Here's the interesting bit, which ties back to robots and identity. You don't care about spoilers, do you? Not with Moffat Who, anyways, I hope. The Silence have put in a "fix" that established the Doctor's death. The Doctor thwarts that death by "wearing" a nameless, shapeshifting, time-traveling robot as if it were a suit and running it from the eyeball, but this is insufficient: he's simultaneously alienate himself from his relationships, and has to re-connect in order for it work; the entire family unit, in fact, has to examine its power-relationships and balance them out before they can be effective.